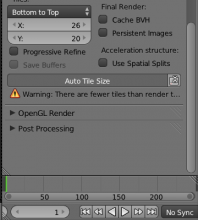 This addon gives you some quick controls to get the best possible tile sizes for the fastest possible Cycles render. Usually it's a good idea to stick to powers of 2 (16, 64, 256...) to get fast renders, however in the case of tile sizes it's even more important to keep the tiles fairly square and of consistent size. Having some tiles smaller than the rest due to the borders of the image makes for longer renders. As a rule of thumb, GPUs like bigger tiles (256 x 256 usually) and CPUs like smaller ones (often 32 square), thus the two target values are stored separately in case you switch between then often. Just remember to hit the Set button! Fixed silly error after removing some debugging code, line 75 error. Added support for Blender Render (BI) and made sure it wouldn't screw with any other renderers. Also tweaked UI. Is there a way to get your script to automatically load with recent Blender versions? 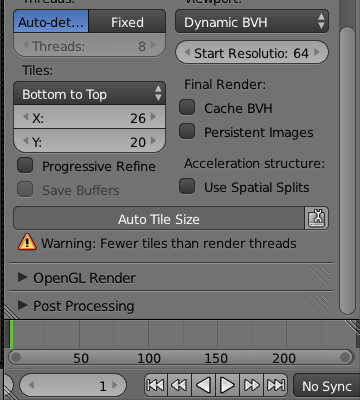 Presently, auto_tile_size_release_03.py is always disabled in user prefs whenever Blender is started. Tried 2.69, 2,70a and 2.72. Tried saving user prefs, start-up file, Auto Run Python Scripts (enabled/(default) disabled), saving a regular .blend file and lastly (as an inexperienced coder this should give you a smile if nothing else :) ) changing Blender version in script. 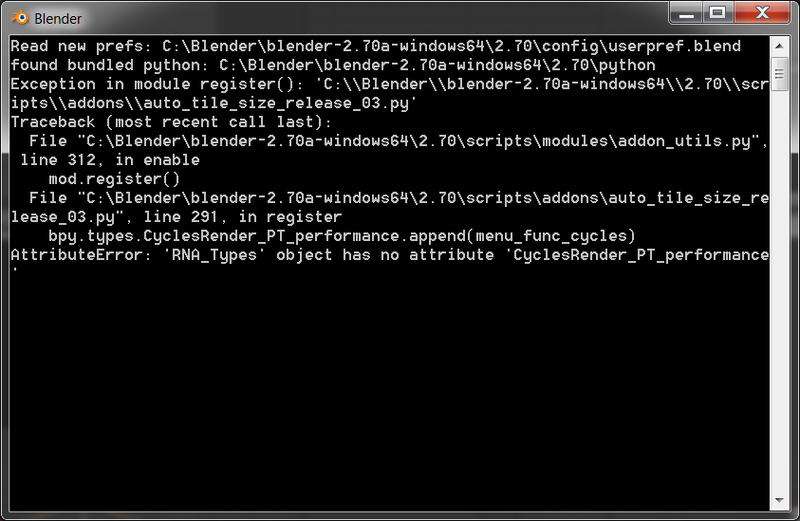 In case helpful, other scripts are loading okay at Blender start. You've done a great job with the script, think it should be integrated into Blender, especially so with upcoming Cycles as default render engine. Just to clarify, meant 'me' as an inexperienced coder. Hi David, glad it's helpful! Maybe caused by the fact I do not use install versions, always zip download versions each with their own 'config' folder. 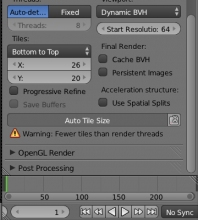 Run several versions of Blender depending on needs. Although, as previously mentioned, other scripts (placed in scripts\addons) are starting? Forgot to mention, even tried removing the script from scripts\addons and installing the script through user prefs Addons. Well if there's nothing printed to the console, then I've run out of ideas. Perhaps report a bug, but make sure to mention that it works just fine for me (win7 64 bit as well) and may not be a problem in the addon. 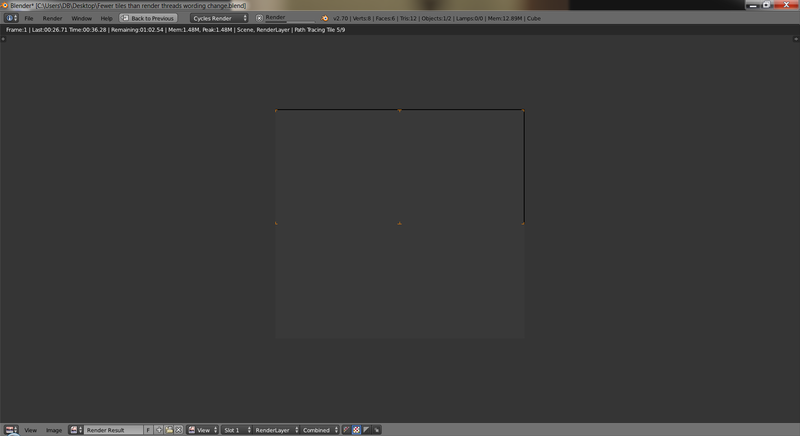 Installed in AppData\Roaming|Blender Foundation\Blender\2.70\scripts\addons it then works. Any idea why this particular script will not not start locally? This comment was removed by David Black (david_black). So it's loading on start-up fine now? Looks like the problem might have just been because you had it installed in two different places. But might be something more obscure like it loaded the auto-tile-size add-on before it loaded the cycles add-on, thus the performance panel didn't exists yet and it failed to load. Ok good. Probably caused by Cycles loading after this add-on then. I think the AppData... path is where installed scripts are supposed to go, and those in the local blender scripts folder are those that come bundled with blender by default. Thanks for checking! Interesting, thank you for the information. Reason I keep the few extra scripts I use locally, so Blender can be used as a portable app on other computers without the need to update anything. Also easy to compare different Blender and script versions. Other than using Appdata folder, is there a way I can delay script loading until after Cycles is loaded, or is it the core of how Blender is designed loading local scripts first and Appdata scripts later? I'm not sure - you'd have to ask someone else, perhaps in the #blendercoders channel of freenode IRC. As a brief follow up, able to confirm your Cycles loading later theory. allows the script to start while stored locally. In closing, are there a few very minor modifications needed before submitting for Blender inclusion? Hope your weekend is going well, thanks again for your help and suggestions. Much more stable estimation - much simpler math and predictable results. Please ignore the original description at the top - Some of it is incorrect and I don't have permission to edit it. It's all controlled in the background by handlers, updating the tile size each time one of the above changes. It also throws warnings when there are fewer tiles than available cpu threads, or if the calculated tile size is not very square (square tiles generally render quicker), although it is very uncommon for this to happen. [note] I have done extensive testing on various kinds of scenes, and came to the conclusion that on average, around 64x64 is best for Blender Render, 32x32 for Cycles CPU and 256x256 for Cycles GPU. These are just generalisations though, the real advantage of this add-on is that it calculates the tile size to avoid having long narrow tiles on the borders of the image which often cause a small performance hit. Addon seems to be working nice, and it is indeed a nice addition. Do not clutter the Scene class with a bunch of properties, please use a single PropertyGroup one to gather all your settings (see this page). Do not use CamelCase for properties nor functions. Our code style requires CamelCase only for class names, functions, vars and class members should use that_style_of_naming. Btw, do you have a commit access to addons repositories? If not, I can make the commit to addons_contrib on your behalf, will just need a valid mail address (so that you are correctly marked as author in git's logs). After testing version 04, discovered people using a higher interface DPI setting only see part of the warning message, as seen below at 86 DPI. After a small moment of lateral thinking, considered, do you need a warning message? Instead of displaying a warning, is it possible to just keep reducing tile sizes, so there are never fewer tiles than threads? It would be very rare for anyone to have a border size less then 8 or 12 pixels. Is it possible to detect GPU render threads? If you only have access to one GPU, (having two GPU's solely for GPGPU) I can test a script for you if helpful? In closing, encountered some unusual behavior while using border render, .blend file below (very high sample setting so tile area remains visible for longer). Keep up the great work, looking forward to seeing your script included in Blender. Addressed those two issues - now uses a PropertyGroup, and functions+vars are not CamelCase. My email is gregzzmail@gmail.com - though I'd prefer not to have to rely on someone else to commit on my behalf. I have commit access to Addons, but I don't think I have access for Addons-Contrib. Can check again once this is ready. btw @David Black (david_black) - those 1-pixel-wide tiles on the edge are fixed now too, was just a rounding error. I've also tried to move it to \addons as well as \addons_contrib (which anyway I think shouldn't be done from a formal point of view) but I get always the exact same error and the addon does not activate from the Preferences|Addons. I thought it needed to have the render engine set to Cycles as the default one but even that didn't help. FYI, I'm running the latest official 2.72b release in its own controlled environment (to exclude local AppData user settings from being taken into account) on a Win7 Pro 64bit SP1 OS and I don't use CUDA, only CPU computing. Thank you very much Greg for your lightning fast reply and fix. Now it works perfectly! Have a pleasant evening. Thanks harvester for the \addons_extern folder information, this fixes previously reported script-starting issues while running Blender locally. Knew there had to be a solution after testing the PortableApps version of Blender, which allows a previous version of the script to start without errors. In principle, the \addons folder shouldn't be touched since it contains the officially supported add-ons, as well as the \addons_contrib because I sync it via GIT with the online repository. All the other unofficial or thirdparty addons (eg. Luxrender, Mitsuba, YafaRay, Greg's addon etc.) should be placed inside the \addons_extern folder. At least this is my understanding of how add-ons should be properly managed. Please, note that I use ONLY the Blender's zipped packages which allow me to set up different specific "controlled" environments (production and/or testing) that don't interact or conflict with eachother giving me the freedom to use whatever version I like or need to work with. Code is globally OK now. Still did a cleanup pass, there were some things to improve yet (mostly: style, needless complexity like using an enum for the 'optimal tiles' option, and general simplifications like deduplicating some logic, etc.). Should be no behavior changes from user PoV, would be good to double-check I did not break anything though, ended up making quite big changes in some areas. If you are OK with it, please commit it (if you need access to contrib, poke Campbell on IRC). Just tried your modified version in 2.72b and found an issue. 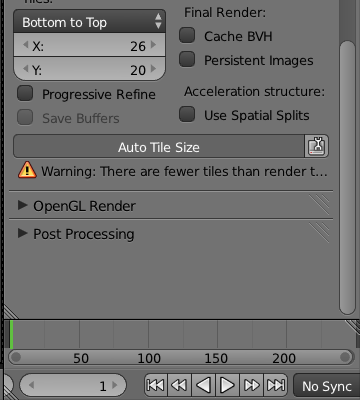 Normally, clicking Auto Tile Size (grey bar) toggles on/off auto tile size function, in your version it causes the grey bar to vanish with seemingly no way to reactive the auto tile function until Blender is closed and re-opened. Made a few minor changes (diff) - fixed David's issue (no need to do ats_poll when adding the UI, the buttons should always be visible); some minor alignment stuff and use_optimal UI text. Will commit this sometime soon. Could someone write an add-on that comes with a few sample scenes that everyone could render at different tile sizes (and other hardware-specific render settings, if there are any like that), preferably automated, and send the render times for each setting combination together with the hardware (and OS) setup info to a database? Then that add-on could source the settings via a single "Find the optimal settings for my machine." click for everyone. Seems grossly inefficient that stuff like this is still sorted out via forum posts and guessing games if it could be easily solved via a data-driven crowdsourcing approach.